for Windows XP, Vista, Windows 7, Windows 8 and compatible OS. You will be alerted automatically always when new email message arrived. Integrated attachments viewer. Lockable sidebar for seniors. EasyEmail is an email client for windows used for reading, sending and manage a user's emails and allows user's to be notified about all incoming emails. Email client allows you to define own list of buddies (VIP persons or filters) and you will be notified about all incoming emails from each buddy separatelly. You do not need to check email everytime when new email is incoming. Email client EasyEmail has only two buttons one for reading messages and one for writing message to your buddy (family members, coworkers for example). Standard edition of EasyEmail is specially designed for seniors and other PC begginers. EasyEmail supports Import and Export of messages also. Email client is ready to read and write messages via POP3 or IMAP protocol via your email accounts. Email accounts on gmail, hotmail,... are also supported. See more screenshots here. Compare EasyEmail versions here. Side bar of EasyEmail client. Is possible to lock them on the screen, or minimize it to tray icon. EasyEmail email client allows you to make your own list of buddies (your VIP person) for example your familly members, friends or your coworkers. Email client will notify you when new email arrives from any person in your buddy list or any email arrives to any from defined email accounts (gmail, hotmail, live accounts are also supported). EasyEmail email client allows you to lock side bar on the screen and to prevent PC begginers (seniors or juniors for example) to close email client. Email notification side bar of EasyEmail email client has only two buttons per buddy: Read which allow read emails from selected buddy (click once) and Write which allows you to quick write message to selected buddy (click once). Just only to drag and drop any files (pictures for example) to the buddy for creating new message with attached files. 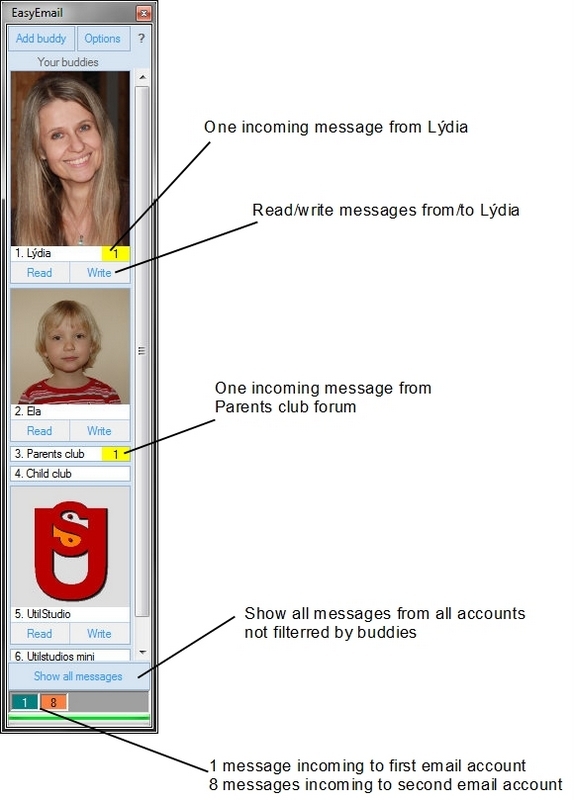 Click "Paste" only to create new message with the text message stored on clipboard, or picture stored on clipboard to add it as an attachment. To send printscreen just only click "Alt+PrntSrcn" and click "Paste" button on selected buddy. EasyEmail client have "all accounts inbox", which allow you to read or search all incoming emails messages across all defined accounts at one place. Supports POP3 and IMAP protocols (google, hotmail, live,... email accounts are also supported). Feel free to use freeware version of EasyEmail for free. Three modes of buddies. You may select which mode is best for you. It si possible to combine them. Window of messages of EasyEmail email client allows you to show messages only from/to one selected buddy or VIP person or allows you to show all incoming messages (inbox) of all accounts. You may select any folder of selected account of course to show messages. Notification panel of email client will notify you about unread incoming messages from all email accounts. Progress bars shows progress of notification. Settings allows you to hide progress bar, if you do not want to see it. 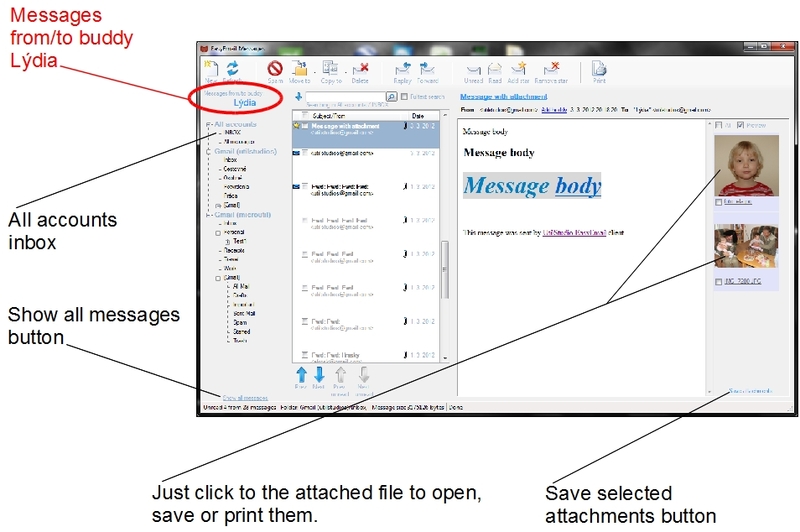 Email client attachments viewer allows you to view, open, save or print attached files. EasyEmail has been reviewed by Frederick Barton on 26 Nov 2012. Based on the user interface, features and complexity, Findmysoft has rated UtilStudio Photo Resizer 5 out of 5 stars, naming it Essential. See short video and product review.